Mellow | The Electric Drive that fits under any Skateboard – Mellow Boards GmbH | What is an Electric Skateboard? |What is an Electric Skateboard? It's probably just the lightest fastest people-mover there is! Take a skateboard, add a battery, motors and a remote control. You can buy it ready-made, build it yourself, or convert any flat object. An electric skateboard gives you the power to travel as fast as traffic, speed up hills and brake gently down them as you recharge your batteries, whistling your favorite cheerful tune through smiling teeth. There is no end to the reasons to ride. Why worry about gimmicky self-balancing with a not-too-high chance of faceplanting, when four wheels are stable as a table. (ok, a rolling table) Paradoxically, this hurtling engine of fury is also *perfect* for ...beginners!!! Built-in brakes and no pushing mean that you simply need to keep your chin up to ride happy. 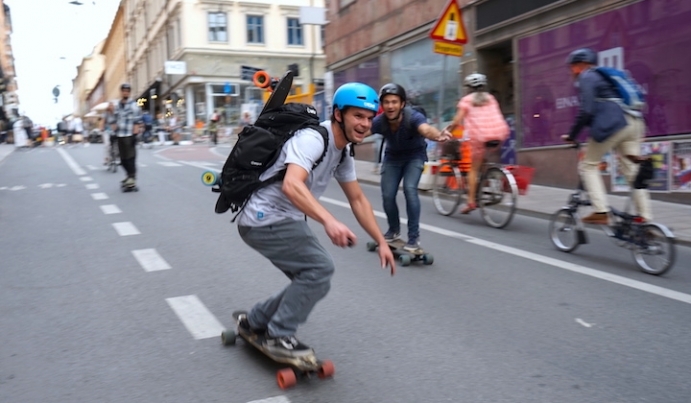 Yes, you read that correctly: An electric skateboard is easier to ride than a normal one. Here's a rundown of your basic components, with a pinch of nerdy details. Future blog posts on each will make you an expert in nothing flat - giving you the simple knowledge to separate advertising claims from real-world performance. Thanks to smartphones, power dense lithium ion is cheap, light and small enough to be taken anywhere. Some electric skateboards add a bit of extra weight and battery cells to give you longer range (and charging time), while quick swappable battery packs let you pop in a fresh one in an eyeblink. Assembling several cells into a single battery pack give you the voltage and current (more on this later) that define your top speed and hill climbing ability. Insanely powerful and microprocessor controlled, motors are usually placed next to the axle to drive a belt connected to the wheel, or found directly inside them, called hub motors or in wheel moters. If hitting the ground with two (or four!) pieces of precision engineering sounds like risky business, make sure they're designed for durability and longevity. Size, precision, efficiency and materials define your electrical skateboard's actual 'mechanical power' and contribute to making the best use of your board's batteries while keeping the ride exciting. Although most electric skateboard & longboard makers have agreed on wireless, secure connections, there's many different types of remote controls to make your motorized skateboard move: thumb wheel, thumb joystick, index finger trigger or thumb slider rc controls. It's best to prefer designs without protruding elements to avoid accidents caused by unwanted braking or movement, and look for durable or even waterproof designs if needed. As expected, all the above listedd parts need artificial brainpower to make them run: a battery management system and an electronic speed controller. Both make sure that the right amounts of energy are directed to the right places under the right conditions. Not all microprocessors are created equal: clever programming can bend the laws of physics to produce higher speeds on low battery, maintain acceleration where speed usually replaces it, and even double your battery's useful life. Older electronic skateboards with stiff battery enclosures and high friction belt drives made actual unpowered skating impossible. Freewheeling hub motors and self-contained mountable electric skateboard drives now give freedom of choice back to the rider. The advent of smaller electric skateboard kits means not only the ability to push - really push - like on a normal skateboard, but also the ability to customize your own deck shape & flex like a real skateboard and to make your ride stand out and not have to ride a cookie cutter deck like the next guy. The electric skateboarding scene is a thriving community of newcomers, longtime riders and makers (DIY). Come join the discussion on Reddit, or forums such as electric-skateboard.builders and endless-sphere.com. Discuss this post in its Reddit thread. Browse the Electric skateboarding subreddit.